Microsoft announced an upcoming latest Bluetooth keyboard back at the Mobile World Congress earlier this year and they’ve named it the Universal foldable keyboard. This is a specialized tech related keyboard that can be used for the mobile devices, which when needed can be folded into half. This Universal foldable keyboard is different from Microsoft’s popular Universal Mobile Keyboard, which cannot be folded, However it does perform the same functions to some extent such as pairing with Android, iOS, Windows and OS X devices. Microsoft claims that this keyboard enhances the customer experience of typing and allows better writing than tapping on the screen alone. It became available for purchase yesterday and you can get your hands on this device for $99.95. This newly publicized Universal Folding Keyboard can work efficiently for up to three months between charges, so don’t worry about constant charging. This keyboard is extremely lightweight and also easy to use since it’s portable in nature, this property of being portable allows you to take it anywhere by just tossing it down in your bag or luggage. It also contains a magnetic enclosure which allows it to shut down itself once you press it towards the closing side. Other than the above mentioned characteristics, it can also be paired with two devices at the same time and you can easily switch between the two just by tapping a button. “Supporting iOS and Android isn’t unusual for Microsoft’s keyboards, but the company has gone a step further this time. The Universal Mobile Keyboard includes an Android home key and a cmd key typically found on Apple keyboards. Although it also works with Windows tablets, Microsoft hasn’t even stamped a Windows logo on the keyboard — a rare move for the company. That makes this tablet keyboard the only one in Microsoft’s range of wired and wireless keyboards without the traditional Windows key”. 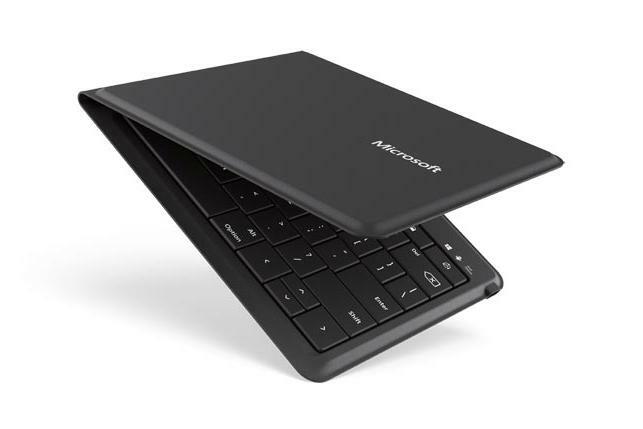 According to Microsoft, the experience of using this foldable keyboard should be easier however the critics says that it is similar to using the keyboard for the Surface 3, which is quiet shallow and hard. The keys seem shorter and are harder to differentiate (much like working with a small touchscreen) and so the Universal Mobile Keyboard is preferred over this one even though it is not as portable as the new one it still has a better typing experience. The company announced that the Universal Folding Keyboard is now available at Microsoft stores, Microsoft’s Online Stores and Amazon. The post Microsoft’s New Universal Foldable Keyboard Is Now Here by Ahmed Bilal appeared first on WCCFtech. Previous articleWill Meizu Become Nokia’s New Smartphone Partner?